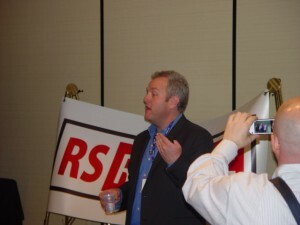 CPAC Live – Andrew Breitbart in Bloggers Lounge | Virginia Right! Andrew Breitbart, the man that brought the ACORN corruption to light on his BigGovernment.com web site stopped by the blogger’s lounge for a lengthy visit. I have a video that is a must see and will get that uploaded to YouTube later this evening after processing. Breightbart urged all of the bloggers to continue exposing the liberals who are using political correctness to try to destroy those who would expose their Alinsky tactics and ACORN and SEIU corruption. Currently, Amb. John Bolton is addressing the CPAC crowd. ← Pelosi Pinata at Georgetown Watering Hole! Virginia Right! Was There! Details.